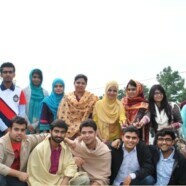 The Formanites Education Society successfully arranged a trip to Nathiya Gali via Islamabad, Murree, Ayubia. 29 students went on the trip which left FCC on Friday at 4:30 pm and reached Nathiya Gali at 6:00 am. The students then proceeded to Nathiya Gali track. The students then trekked through Ayubia and then experienced the beauty of Ayubia through a chairlift ride. Afterwards they went back to guest house. In the evening, they had a bonfire and enjoyed gaming in the guest house. The next day the students started out for Islamabad, where they visited Damn-e-Koh before starting back for Lahore. The trip turned out to be very refreshing for all the students who were a part of it.